Pinker recommended to his hundreds of thousands of Twitter followers this article in alt-right Quillette entitled Heritability and why Parents (but not Parenting Matter) written by his old buddy Razib Khan and a criminologist, Brian Boutwell. Brian Boutwell, Ph.D. is Associate Dean for Research and Corporate Partnerships, College for Public Health and Social Justice and Associate Professor Criminology and Criminal Justice at Saint Louis University, College for Public Health and Social Justice. ...Criminologists (and psychologists) have been aware for some time that criminal involvement runs in families* and is also heritable (a good portion of that heritability seems to be narrow-sense, though not all; see quillette.com/#comments). The psychologist Robert Krueger and colleagues some years back, provided evidence that humans mate assortatively for antisocial and criminogenic behaviors (put differently, highly antisocial individuals tend to pair off with each other in a non-random fashion). Does this completely explain the concentration of crime in certain families? No. Can it be safely ignored and assumed to be irrelevant? No. Just as narrow-sense heritability is a puzzle piece that can tell you something about where the distribution of a trait could be headed in a population, it also helps inform the question of why certain traits cluster in families. 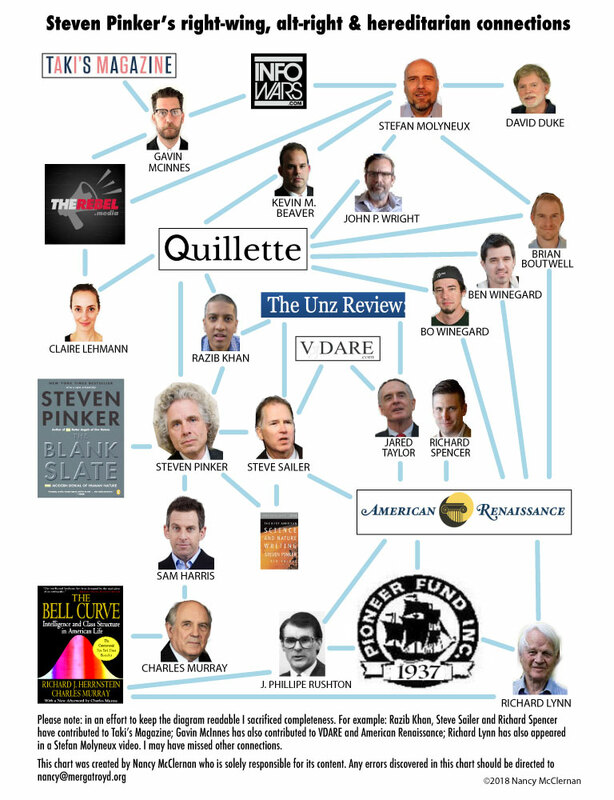 Boutwell has authored or co-authored, if my count is correct 24 articles for alt-right Quillette. Surely if criminality ran in families the Irish would still have high rates of violent crime. New South Wales, a state in southeast Australia, was founded by the British as a penal colony in 1788. Over the next 80 years, more than 160,000 convicts were transported to Australia from England, Ireland, Scotland and Wales, in lieu of being given the death penalty. Today, about 20% of Australians are descendants of convicts, including plenty of prominent citizens. Wow, Australia must be a hellhole of criminality based on the family crime trait theory. Oops, nope, Australia has lower murder rates than most countries, including England. So does Pinker agree with the hereditarian explanation about crime or the environmental one? He can't have it both ways, the two are mutually exclusive. Now, if you've never heard these facts before and you stumble across them, or someone mentions them, it is possible to come to some extreme conclusions. Such as that women are inferior, that African Americans are naturally violent. It turns out that Brian Boutwell has come to the "extreme conclusion" that African Americans are naturally less intelligent than whites. The reason why Whites and East Asians have wider hips than Blacks, and so make poorer runners is because they give birth to larger brained babies. During evolution, increasing cranial size meant women had to have a wider pelvis. Further, the hormones that give Blacks an edge at sports makes them restless in school and prone to crime. It is true that bigoted people might use data about race and IQ to support nefarious political agendas, buttressing their own prejudices with scientific sounding arguments. However, the way to address this danger is not by distorting previous research or publicly attacking scholars who investigate this issue. Rather, it is by promoting the vision of society that Martin Luther King, Jr. advocated decades ago, one in which people are judged by their actions and the content of their characters and not by the average traits of a group (ethnic, political, religious, or otherwise). The reality of racial variation cannot be hidden behind a veil of pleasant myths in perpetuity. And if researchers and moralists insist upon a noble lie about human genetic sameness, then they will not be prepared to grapple with the difficult ethical challenges that human variation in a cosmopolitan society presents. It's breath-taking the way Boutwell jumps from "not be judged by the color of their skin" to "the reality of racial variation" which means, in practice, claiming black people are genetically less intelligent and more criminal than white people. So what actually distinguishes Boutwell from a bigot with nefarious political agendas, buttressing his own prejudice with scientific-sounding arguments? Boutwell's "science" is bad. First because although race means everything to Boutwell and the hereditarians, they have no clear definition of race, and so there is no objective way to determine the "race" of any individual. Although they've learned from alt-right racist Steve Sailer to claim that this is all perfectly fine because we can't expect to have "platonic essences." They admit to not testing subjects for genetic ancestry. They don't admit they got lots of their data from racists. Although they did. And then there's the Northern Superiority Hypothesis that Richard Lynn appears to have dreamed up. I've mentioned Lynn, making claims about Irish, English, Welsh and Scottish intelligence although they are genetically indistinguishable from each other. And what about nefarious political agendas? Boutwell has no qualms about promoting his theories both via alt-right racist Stefan Molyneux, and by allowing the white supremacist media outlet American Renaissance to republish his work from Quillette. Apparently there is nothing that a scientific racialist like Brian Boutwell can do that is racist, in his mind, not even making common cause with white supremacists. So while Steven Pinker is pointing at the media and colleges, claiming they are inadvertently radicalizing the alt-right by denying "the truth" which leads to them over-reacting and believing that blacks are naturally violent, Pinker is sending his Twitter followers directly to people who say the very thing he considers an "extreme conclusion." It's not the media and the colleges who are radicalizing people, it's Steven Pinker himself. 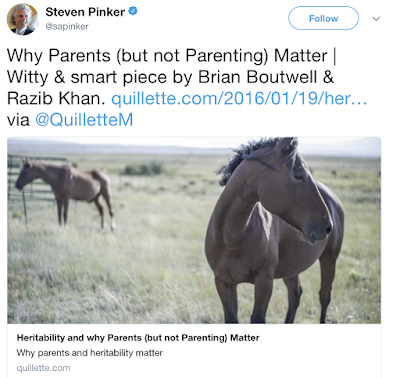 Both by connecting to the work of racialists but also by lending racialists like Boutwell and Khan and Steve Sailer respectability thanks to his own science celebrity.